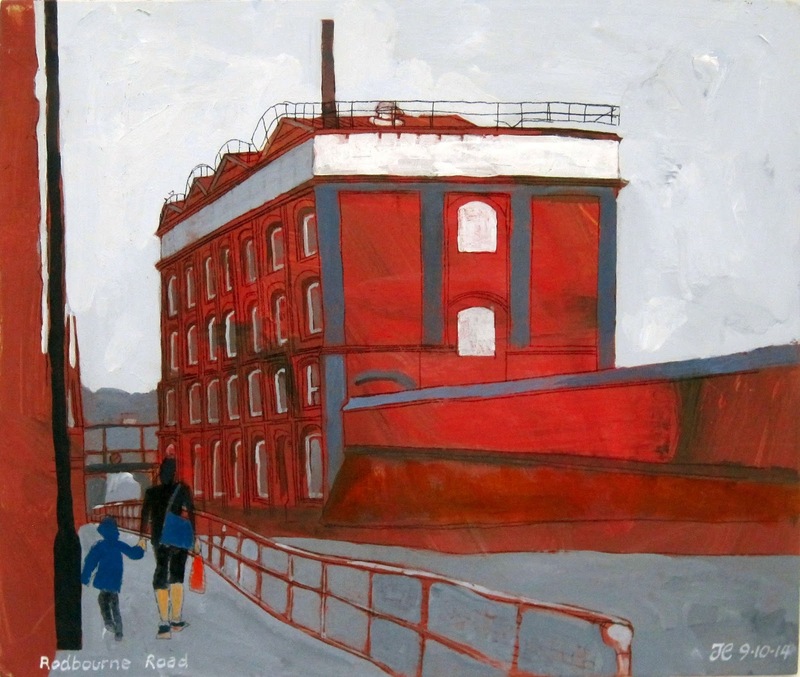 Tim Carroll's wonderful painting of Rodbourne Road graces the front of our new Journal the first edition with colour pages, members should be receiving one soon. If any Friends would like a PDF version please contact with your membership number via the email in the Journal and we'll send one to you. For those waiting for the results of the Christmas Quiz they are here following the questions to give you all a second chance. The prize was won by Jill Sharp who was the first correct entry out of John Walsh's cap. CHRISTMAS QUIZ QUESTIONS The answers have something in common. 1. A recitation of 32 points, one way or the other. 2. Ernie Bevin used this as a metaphor for the Council of Europe, and feared it might emit “Trojan ‘Orses”. 3. An eccentric gentleman chose to be buried vertically here, his head towards the centre of the Earth. 4. West of Swindon and just under three kilometres long. 5. Lord Brougham’s somewhat disparaging description of the English system of justice. 6. A comic opera by Sullivan without Gilbert. 7. An essential component of a multiple-choice quiz or survey. 8. He had 42 of them, but “they were all left behind on the beach”. 9. What followed the Midnight Folk? 10. A suitable day to do this quiz? Before the answers here is a portrait by John Singer Sargent of Gabriel Fauré to find out more read John Walsh's fascinating feature in the new Journal. William Morris, artist, writer, manufacturer and utopian socialist, died in 1896. But his overcoat is still hanging behind a door in the entrance hall at Kelmscott Manor. For many years Morris rented the beautiful old house, over the Thames from Buscot, as a retreat for himself, his wife Janey and their daughters Jenny and May. They loved to escape to Kelmscott from their busy life in London. The well-worn coat was one of the many evocative objects that caught Sasha Ward’s eye when she arrived at Kelmscott in May 2014 as the first Artist in Residence. “The house is full of personal belongings, and fabrics embroidered by Janey and May” says Sasha. “And there are places you recognise from Morris’s letters. It can be quite spooky sometimes”. Sasha fell in love with stained glass as a teenager, when three friends visiting Chartres Cathedral sent her postcards of the windows. She lives in Marlborough, where she has a studio and the all-important kiln in which she can fire sheets of glass up to a metre wide and two metres long. At Kelmscott, Sasha set up a workshop in the Brewhouse. There she worked on a series of small stained glass panels, explaining the process to the visitors and encouraging them to take part. One project was inspired by a window pane on which May Morris and her friends had scratched their names. 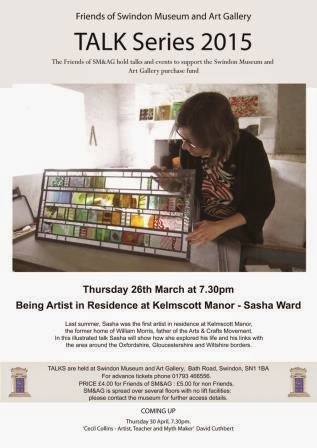 Sasha invited people to sign their names on scraps of glass with a diamond-tipped pen, and assembled the pieces – bearing 103 signatures - into a window which has now been installed at Kelmscott. 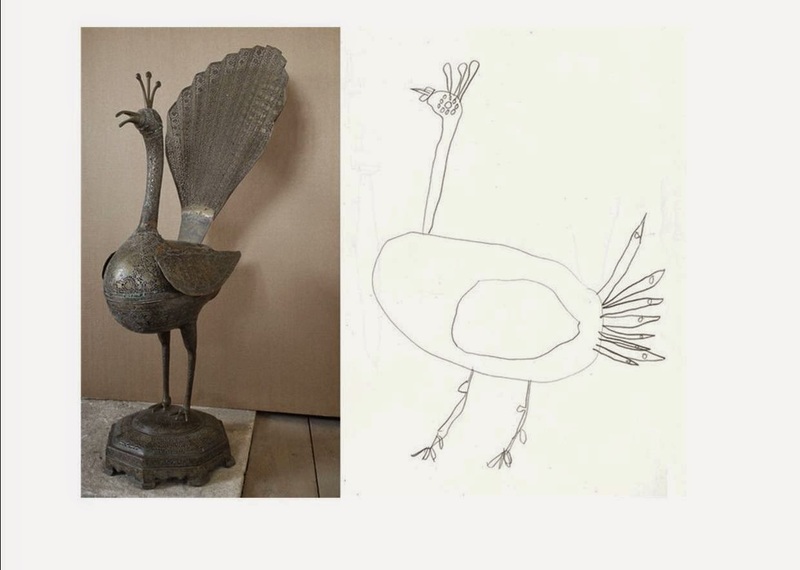 Visiting children were given pencils and paper and encouraged to draw things that appealed to them, and there were workshops for adults and children. 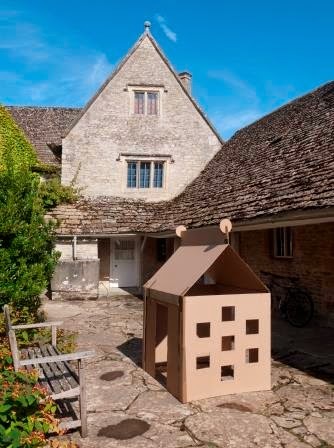 A tiny “box cottage” belonging to May Morris is on show at Kelmscott; it was discovered in one of the attics. Now the visitors made “stained glass” windows and block-printed wallpaper, and used them to turn cardboard play-houses into richly patterned Arts and Crafts residences. Polystyrene tiles made excellent wallpaper blocks! For the second year running, Kelmscott Manor has been shortlisted for the title of “Most Inspiring Heritage Attraction”. The house is currently closed for the winter but will be open to the public on Wednesdays and Saturdays from the beginning of April. Sasha's drawing of the WM overcoat still on the back of the door! Tickets for the talk can be reserved by ringing the Museum on 01793 466556, from the Museum during opening hours Wed-Sat 11am-3pm, or turn up from 7pm on the night. Karen led us through the paintings by considering the depiction and use of space in the 20th century in paintings, and using a small hand held projector gave examples to supplement those on the wall of what she was saying, and at some times, to show an artist's progression over as little time as a year. Above the Henry Moore, 'Three Women and a Child' from Swindon with 'The Hands' by Barbara Hepworth, and 'Figure Composition' by David Bomberg on the left. Above the Ravilious tennis game, here reality is confused by a slight distortion of perspective. Methods of changing one's sense of reality also include having the scale 'out', confusing the sense of depth, also having a low view point, we were shown examples of these. What is really great about these intimate talks is that the visitor can ask questions and gain more understanding of the works. In the one below, 'The wallet begins to empty', he descends the steps and is humiliated, just as Tom Rakewell is when he is arrested in Hogarth's version. The next one depicts as we can see, 'Bedlam', the oldest asylum for the mentally ill. In Hockney's version, he imagines a consumer culture hell, where everyone looks and dresses the same, and does the same thing. The 'Reality Questioned' exhibition runs until 31 August, do try and go and see it. Many thanks again Karen MacDonald for making the visit so special and altering the way I look at paintings. 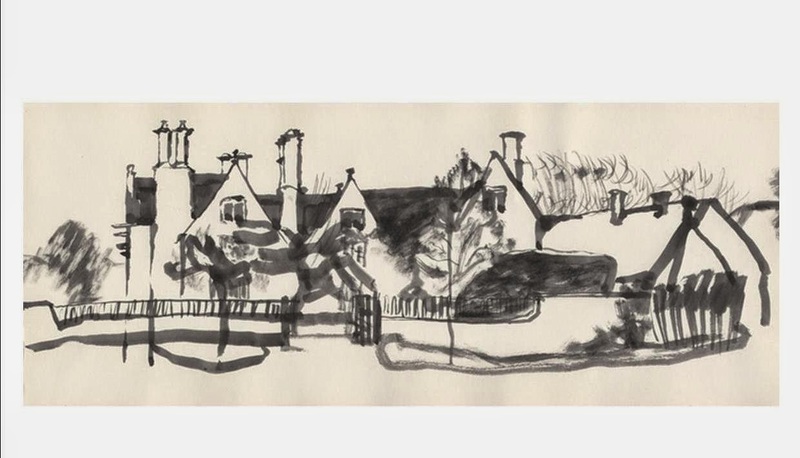 32 works from Swindon Collection are at the Holburne Museum! 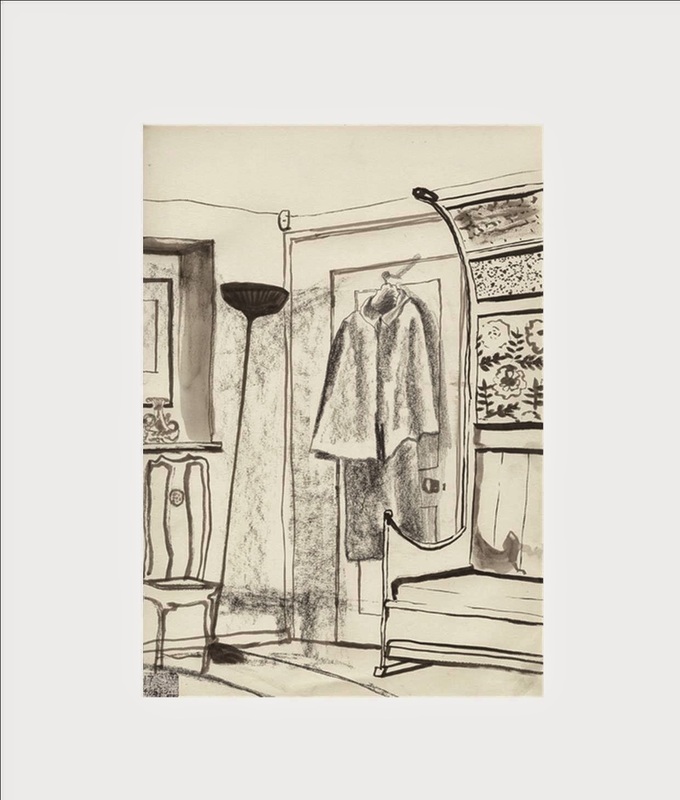 I was very keen to go to the opening night of this Frameworks exhibition at the Holburne Museum on March 1 to see which works contemporary artist, Dexter Dalwood, had chosen for this exhibition from the Swindon Collection. The theme is Home and the World with domestic stability being pitched against artistic innovation, with in some cases a longing look elsewhere; the exhibition celebrates the response of our greatest artists to the extraordinary changes in 20th Century Britain. The exhibition has been beautifully put together with excellent information attached to the titles, they're very readable and informative. At one point, John Nash's 'Dredgers, Bristol Docks' didn't have anyone in front of it, so I took a photo. One of the great advantages of the Frameworks exhibitions, Modern Art in Britain, being the latest is that paintings from the Swindon Collection have been loaned to The Wilson in Cheltenham, the Bristol Museum and Art Gallery, the Holburne Museum and Victoria Art Gallery, reaching a much wider audience than normal. 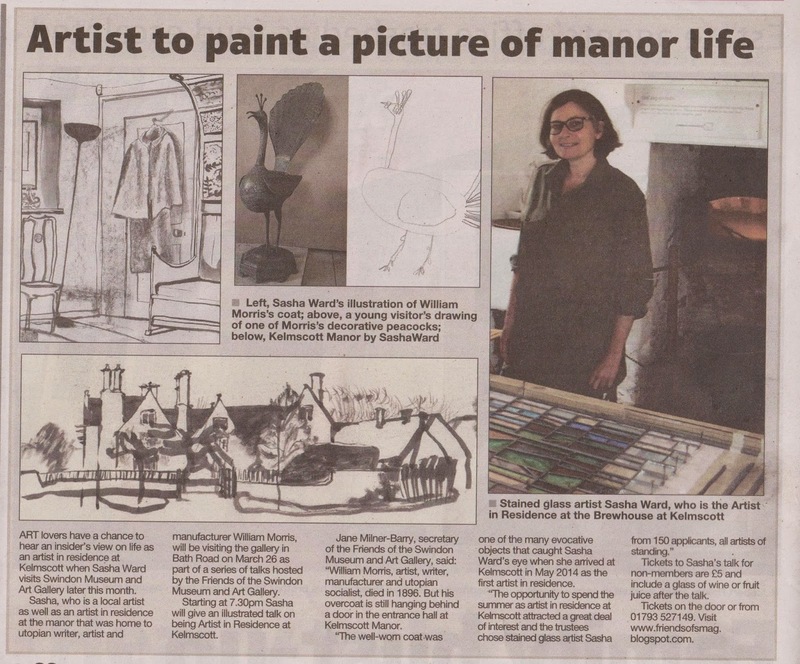 I'm hoping we may even be able to encourage people to visit the Swindon Collection at home! Major Jeremy York was a military attache in Poland between 1988-92, a time when Poland was moving from a Communist state to a free economy, and an aspiring European Union member. Jeremy gave a fascinating talk illustrated by slides taken during his stay, showing what life was like in late twentieth century Poland. For example, horses were often used on farms rather than tractors and even in Warsaw they were commonplace. There were 5 main themes at this time: anguish and suffering, seen in sculptures, primacy of the Roman Catholic church, the good humour of the polish people, diplomatic spying and westernisation and change. The mermaid statue is Warsaw's symbol.. She appears in statue form in Old Town's Market Square, and on the Warsaw coat of arms, but when you travel to Poland's capital city, you will probably spot the image of this mythical creature worked into architectural details and used as a part of business logos. Many legends exist that describe how the mermaid came to symbolize Warsaw. A popular version of this story tells of how the mermaid named Sawa was rescued from capture by a man named Wars. Because of Wars' kindness, Sawa vowed to protect the city. Warsawa (Warsaw) became the name of the city and the mermaid is shown with a sword and shield in recognition of her promise to protect the city. Poland was almost destroyed by Hitler in the second world war, and we were reminded that one and a half million people died in Auchwitz, and 900000 in Treblinka where prisoners lived an average of 3 hours after arriving there. Jeremy York became attached to Poland during his time there, and has visited annually since 1992. The audience was so interested in the 'other world' Jeremy had portrayed so interestingly, like a history lesson without the endless dates and much social history; there were lots of questions and much appreciation of the talk. And talking to members of the Friends afterwards. It seemed only fitting that we went for drinks and a snack at the Polish restaurant in Wood Street, Karczma Polska. We were glad we had done so, the food was delicious and the drinks slipped down. We thought it's a good plan to consider going there again after the next talk.